Lifestory Research conducts the most extensive survey on brand trust in their annual America’s Most Trusted study. Each year, with feedback from over 30,000, people assess their trust in certain brands they encounter during their active search for specific products. Back in 2012, we were at a crisis of trust in America. At that time, Edelman’s Trust Barometer Annual Global Study, showed only 50 percent of American’s trust businesses to do what is right. In 2018, the same study posts the steepest, most dramatic general population decline the Trust Barometer has ever measured for the United States: The crisis is worse today. In today’s marketplace, trust is everything. For more than four decades, the General Social Survey (GSS) has found a steady decline in Americans agreeing “that most people can be trusted or that you can't be too careful in dealing with people.” Today, with only 1 in 5 people saying they trust others, the trust in brands is also at risk. More than any other factor, trust can reduce costs, improve productivity, enhance innovation, improve collaboration, and increase value. Without trust, barriers go up, value goes down, and relationships do not advance. Consumers desire and seek out companies that they have trust in. 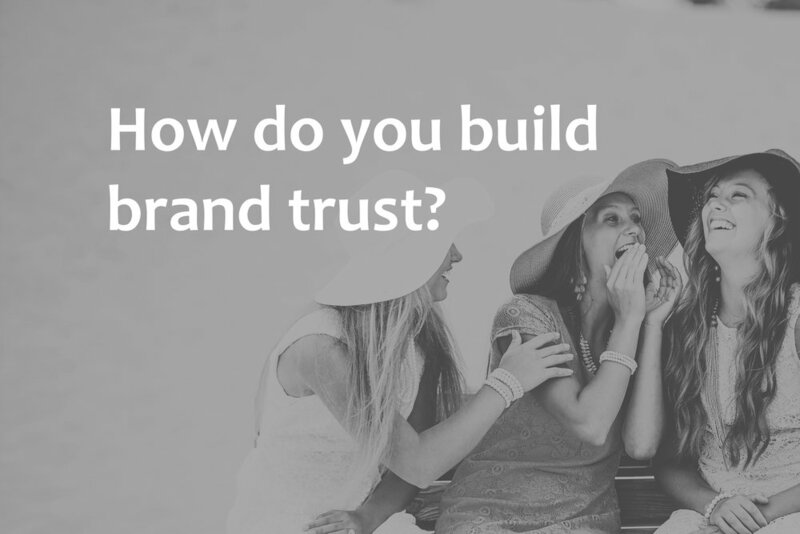 So how do you build trust in your brand? Based on our research, three overarching factors affect trust in a brand: brand reputation, brand reliability, and brand intention. However, core to these factors is a deep understanding of your consumer. How well do you know the people who buy your products? As you read about the three factors that affect trust in a brand, put yourself in the position of the consumer and picture what he or she might be doing and thinking as it relates to these three levers of trust. 1. Brand reputation is the trustworthiness, integrity, and honesty people hold toward a company. Brand reputation is built over time and through various experiences a consumer has with you. An experience can be anything from seeing an advertisement, reading reviews, talking to customer service to using your product. Anytime a consumer hears about you, or from you, or sees your name or logo, they are experiencing your brand. Do you know how they are experiencing your brand? Do you know how they view your brand? And do you know who influences them? 2. Brand reliability is the consumer’s belief that the brand can accomplish its value promise. That is, the brand fulfills or satisfies the consumer’s needs. Brand reliability does not have to be a direct experience with a consumer; it can be established through word of mouth. The expectations you set for consumers must, at the very least, be met. You have to be credible in the mind of the consumer. Do your customers believe in the quality of your product? Do they believe you do what you say you will do? 3. Brand intention is based on the consumer’s belief that the brand will hold the consumer’s interest in mind, especially if a problem arises with the product. Brand intention has become an incredibly challenging factor for many companies in today’s digital landscape. For a consumer to believe you have their interests in mind, a brand must be able to respond quickly and in a friendly, helpful tone. More and more consumers are communicating their grievances on social media channels, expecting brands will respond immediately and solve their problem. Do you know how your customers want to communicate with you? Do you know what it means to have their best interest in mind? Focusing in these three areas is essential whether your customers have a high or low level of trust in your brand. A high level of trust is a luxury that needs protection if you want to sustain it. If you need to improve customer trust, don’t panic. Consumers may not have enough information to have a high level of trust, but you need to find out what is really happening if you want to make improvements. Lifestory is here to help. We can zero in on areas of vulnerability, then determine a path toward higher levels of trust, or if you already have a high level of trust, we can help keep those levels healthy. Coming up on its eighth year, Lifestory will be publishing the most recent results of the study in January 2019. This year the study has asked consumers their level of trust in brands in several product classifications. The study continues to measure consumer trust for home builder brands, laundry appliance brands, faucet brands, paint brands, dishwasher appliance brands, residential brokerage brands, refrigerator appliance brands, HVAC brands, and active adult resort builder brands. New product classes in the study include window brands, vacuum brands, bed mattress brands, computer brands, and other brand categories.